Anyone else enjoyed this musical? My favorite number is "I Can Do Without You". Great chemistry between Doris Day and Howard Keel. They made me laugh throughout the film. Odd that you bring up this film. I haven't seen it, in about 40 years, and I just realized that it's part of the Doris box set of DVDs that I have! I'm going to watch it, tomorrow! I'll get back to you. I'm not such a fan of Keel's; but he's great in a couple of things (KISMET and SEVEN BRIDES FOR SEVEN BROTHERS). So, I'll keep an open mind! I even love the outside "Harry" number. Doris Day was a phenomena in this. Her bar set on the "WIndy City"
was so entertaining...but he came to a tragic end. "Lost My Heart in the Black Hills" is an easy sing-a-long. I wish Robert Osborne had interviewed Doris about the making of this movie. It completely showcases all her acting, singing, and dancing talents. I love it, too but haven't seen it in a while. Might give it another viewing but first I need to watch my Alice Faye set! What's your favorite Alice Faye? I don't have a clear favorite. I'm still waiting to screen the movies in the set, plus one that I TiVo'd from the FMC (Little Old New York). At this time, what I'd like to see most is The Gang's All Here but properly restored to its original Technicolor beauty! I enjoyed seeing this again, after so much time. I was surprised at how familiar and enjoyable the music was to me. Not just the big hit song; but all the tunes. Doris Day was robbed of two major musical film roles, Nellie Forbush in SOUTH PACIFIC and Annie Oakley in ANNIE GET YOUR GUN. This film just drives home how great she would have been in the latter. The whole thing is preposterous, but the wonderful cast keeps things interesting and fun. The DVD looks wonderful, too! South Pacific might have had a lot more pizzazz with Doris Day starring. Was she really considered for Annie Get Your Gun? It's been a while since I read the story about that, just remember that Judy Garland had already filmed some numbers before she was replaced. I think Allyn Ann McLerie also played Blair Brown's mom on "The Days and Nights of Molly Dodd," a quirky favorite TV show of mine from about 20 years ago. She was around a long time, and worked a lot. Watching her in CJ, she was reminding me of Anne Hathaway. I do see the Anne Hathaway/Allyn Anne McClerie resemblance. Johnm, I know that you're not a big Howard fan, but I hope you enjoyed CJ. 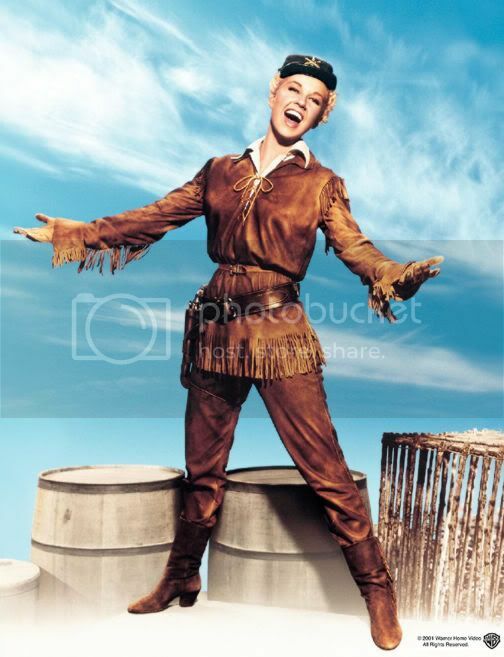 Maybe if Doris had been Annie, there might not have been a Calamity Jane. Also, maybe Judy didn't feel right for Annie from the start. Any info, anyone? 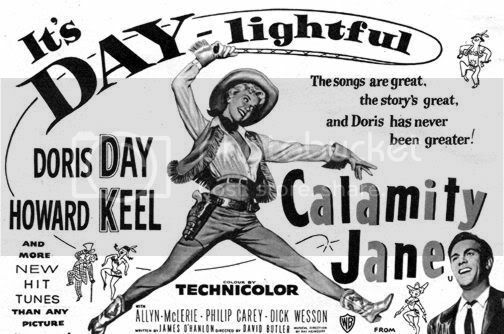 Paul Harvey, Chubby Johnson, Forrest Taylor..
Miss Day has cited Calamity Jane as one of her personal favorites. I never even though about Doris making a splash in South Pacific, but I am now! Well, Judy had already started filming, and were it not for her personal problems, would probably have finished the movie. Have you seen her rendition of "I'm an Indian Too" that's included in That's Entertainment! III? I thought Howard Keel was just swell in CJ. Jack Warner was approached about using DD in AGYG, even before Judy Garland was on board to do it. He declined to loan her, because MGM wasn't offering enough money to cover her salary and for him to make a profit off the loan and make it worth his while. DD was very busy at Warner's, at the time AGYG was being made. You're right about there not probably not being a CJ, if she had made it. Although AGYG has the better score, overall, I really like the songs in CJ, and I prefer it as a film to AGYG. I never liked Betty Hutton, but I did enjoy her interview with RO, a lot! Bunk or not, I'm still glad she made Calamity Jane. Thanks to all that have replied! I enjoyed reading all of the extra info too. but her last acting appearing was in the early nineties. sang that I thought were enjoyable. Anyone have any more info. on Miss McCLerie? organizations, and has had a difficult time since her son died. I really admire the old movie stars who do some kind of charity work or work on behalf of such causes once they retire... Audrey Hepburn and DD are good examples. Well those ad people sure had some imagination.